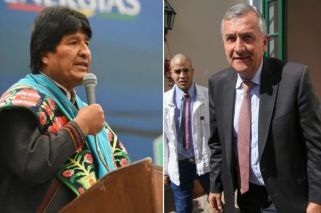 Jujuy Governor Gerardo Morales faced off with Bolivian president Evo Morales over Argentine man's hefty medical costs. The medical costs incurred by an Argentine musician in Bolivia sparked a high-profile, highly public spat this week between the leaders of Bolivia and the Argentine province of Jujuy. Manuel Vica was charged US$10,000 to receive medical attention in Bolivia after suffering a road accident. Jujuy's Governor Gerardo Morales and Bolivian President Evo Morales have tussled over the affair, with attacks flying one way and the other about the costs the neighbouring countries apply on one another's citizens for medical treatment. Earlier this week, Jujuy passed a law to charge foreigners for medical services in the province. The bill, passed by the provincial Legislature, clarifies that all people will continue to receive treatment but an insurance system will be implemented to cover the costs incurred by all foreigners with no demostrable tax payments made in the province. The law allows the Executive branch in Jujuy to "establish a regulatory framework for the authorisation, modalities, exceptions, and retributive values of health care provides under a provincial health tax system to foreign people", according to its text. Provincial lawmaker Ramiro Tizón said the law would authorise the government to charge foreigners who are "transmitting through the province". "It will also allow the Executive to arrange bilateral agreements toward reciprocity: so that when Argentines travel abroad, they receive the same treatment as citizens from other countries when they visit us", he added. Opposition lawmakers in Jujuy described the decision as "xenophobic and backward", alleging it attacks "the most vulnerable people who are immigrants".